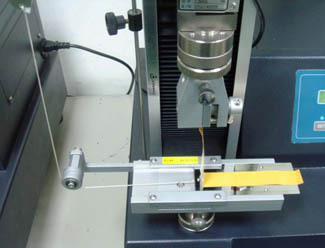 TestResources offers testing products including test machines and fixtures matched to ASTM D3330, which is used for quality assurance tests on pressure-sensitive tapes, and provides a means of assessing uniformity of the adhesion of a given type of tape. The assessment may be within a roll of tape, between rolls, or between production lots. ASTM D3330 Method F addresses the 90 degree peel test and measures adherence to a standard steel panel or other surface of interest for a single-coated tape. D3330 replaces several prior industry standards including, AFERA 4001 Self adhesive tapes – Measurement of peel adhesion, European Norm: EN 1939 Self adhesive tapes – Measures peel adhesion from stainless steel or from its own backing, and Pressure Sensitive Tape Council Standards: PSTC-2 Peel Adhesion for Single Coated Tapes at 90° Angle. 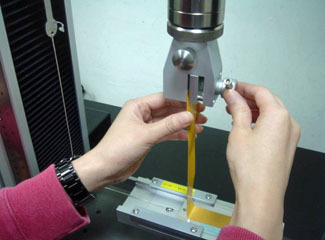 The most common method is to measure adherence by peeling a sample at a 180° angle from a standard steel panel or a specific surface of interest. Fixtures and test machines are available to serve all these needs.